You can now enjoy faster internet while using a Sun Cellular network with the help of their new LTE SIM card that cost you 35 pesos. As long as your area is covered by SMART LTE network and you are using a 4G/LTE capable device, you will surely get better internet speed. You can use this SIM to any device without worrying the slot type as it is already in triple cut (regular, Nano and micro). You now smoothly stream on YouTube, send and receive emails, upload pics on your social media account (Facebook, Twitter, Instagram etc.) without hassle when your register to any Sun LTE promo using your prepaid SIM. The LTE SIM works as normal SIM, you can use it to register any Sun Cellular call, text and data promos. You can see the advantages and features of using this type of SIM versus your regular non-LTE SIM. How to activate Sun LTE SIM? Just dial *221# for new SIM activation. Sun also offers free upgrade to LTE SIM without any charges. All you need to do is bring your old Sun SIM along with one valid ID at your nearest SUN Shop. Tips: You can connect to the Smart network using Sun LTE SIM by doing a manual network operators search. Just turn on the Data Roaming option on your phone. Select Smart 4G/LTE if available, you can still connect to highest available network type. Make sure you set your preferred network to LTE/WCDMA/GSM auto if network is unstable or set to LTE only if you have strong LTE signal. 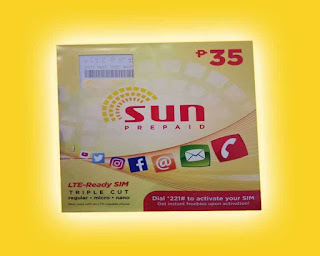 If you are planning to buy SUN LTE, you can visit your nearest Sun Shop, resellers and kiosk to inquire for availability.